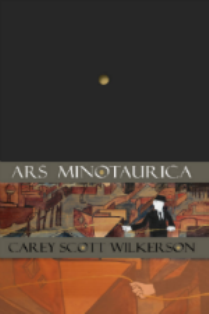 Such a collection as Ars Minotaurica flies so close to the sun that its poetic parts don’t melt as much as dissolve. The poet, Carey Scott Wilkerson, then recycles what’s left over into more poems, and the reader gets the sense that the poet would be content repeating this process ad infinitum. Wilkerson’s work dwells in the space between signifier and signified where he celebrates the slippage of meaning so many others lament. He is the one most likely among us to look upon Duchamp’s “Fountain” without conflict, to urinate and appreciate in one complicated gesture. In the poem, “L’Infamia Di Creti,” when his speaker asks, “Who knows if you ever find your way back,” he is not delivering bad news. Quite the contrary. You and me, he seems to say, we get to stay here forever! Indeed this is the obvious point to make about a book so firmly grounded in the myth of the Minotaur. But the reader is right to ask what Wilkerson is on about here. He clearly resists “naturalism’s false vision.” He pokes fun at himself as a “wild experimentalist,” as “morally transgressive.” But does Wilkerson move past the clichés of post-structuralist poetics as he did in his first book Threading Stone? Aaron Sanders is a fiction writer who lives in Columbus, GA.